Hard to believe this area was once one of London's worst slums, but that was more than a century ago. 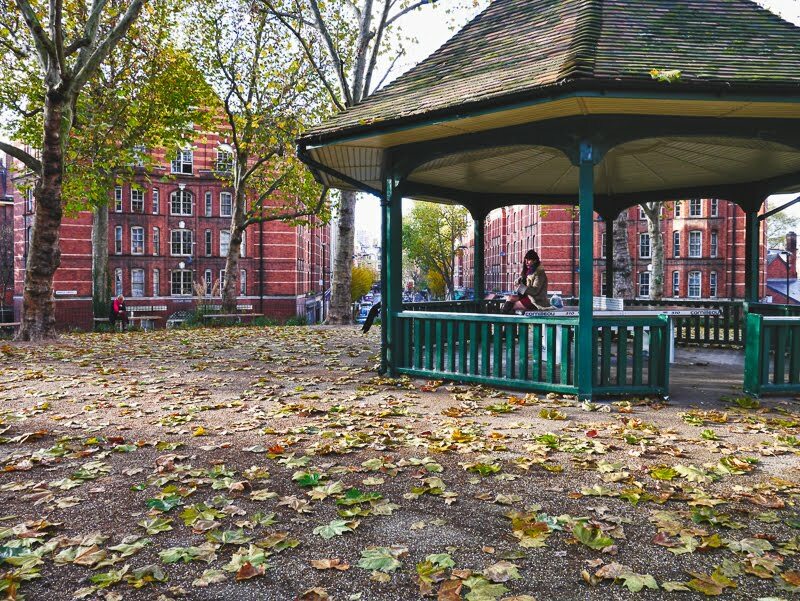 The charming red brick apartments that surround Arnold Circus were built at the turn of the 19th century. Believed to be the world's first council housing estate. Under the Thatcher years tenants were encouraged to buy their council homes, as a result this estate is now a mixture of private and council housing within the same buildings. Grrrrrrr Thatcher!!!!!!!!!! Where's my gun grrrrrr! I think I've cycled around here. Are they on the Thames towpath ride just before you get to Greenwich? Your photo has made this place look very inviting. I like the style of the pavilion too. And I like the composition you created. A friend has a flat in a mixed building like that in Bloomsbury and it is wonderful. It is hard to imagine that this area was ever a slum. It looks charming. Mo, can you tell us where these are located?